Feeling Salty? It’s a Gift! This was lining up to be the first Christmas that I did NOT have homemade gifts to give. I have to admit it’s killing me. There’s nothing better than spending time finding that “just right” item to make or bake and set about happily creating it. Until… you live in a 30′ camper with four frolicking dogs, one loving daughter and a Mr. Bluejeans in a pear tree. The purpose of a handmade gift is to offer something personal and often one of a kind to the person receiving it. Not always a money saver, handmade is a beautiful expression of friendship and love. Lately, my creativity has been spent: figuring out how to store 10 pounds of clothes in a 3 ounce cabinet, roasting chicken and potatoes in our Easy Bake Barbie Camper Oven (skipping to the end of that story… not possible) or line drying my delicates (i.e. everything I own) in a bathroom the size of a phone booth. Gotta make it work ends most of my sentences lately. Yup, I’m creatively pooped. But it’s Christmas and as much as I tried pushing away the thought of making something to give… I just couldn’t let it go. 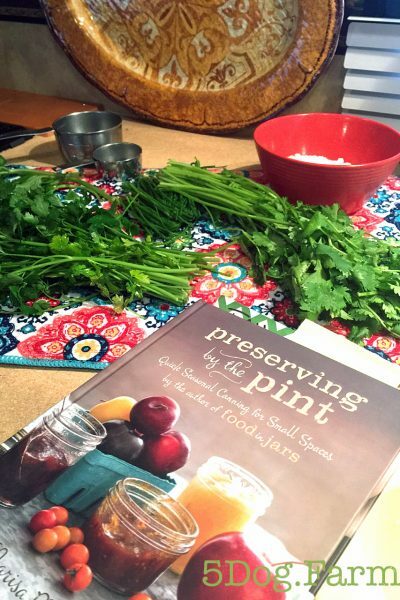 Preserving by the pint, a wonderful book! This herb recipe can be found in Marisa McClellan’s fabulous book Preserving by the Pint. 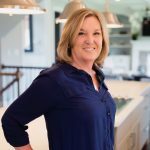 You may also know her as the author/blogger of Food in Jars. 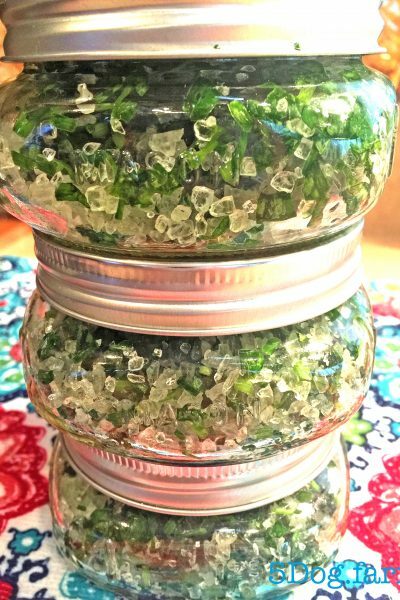 Even before I began writing my blog, I enjoyed making some of the recipes from her website Foodinjars.com which made receiving her book very exciting! So here is my review and adaptation (I was unable to obtain coarse salt) of this great recipe. Those of you that know me know that I enjoy hand chopping most of my food items. It’s my zen. My Ohhhmmmm. 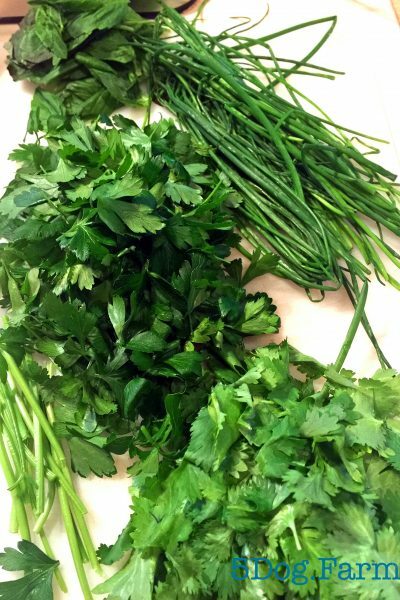 When chopping herbs I rarely use a food processor, unless I want to end up with green paste. Mind you green paste can be tasty when wiped on a roasting chicken or marinating a cut of beef but this is a gift and green paste won’t do. Hand chopping it is… Yippee! The thing I love most about this recipe, besides just how simple it is, is that it lasts indefinitely. Now that’s a gift that keeps on giving! I also love the fact that I can pick whatever herbs I would like to use. In this case, I chose Italian parsley, cilantro, chives and basil (really they chose me because December isn’t exactly “fresh herb season” but let’s not be nit picky). 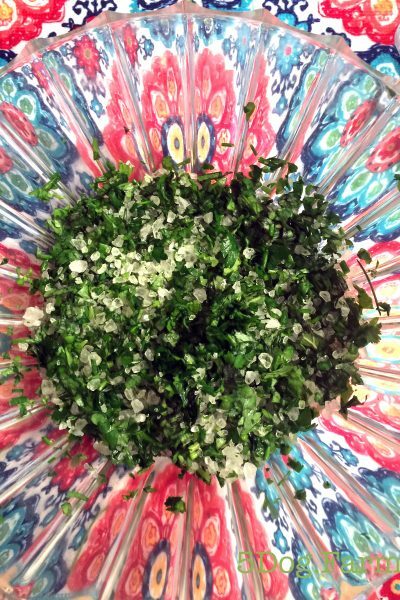 Once our herb garden is up and running, visions of mint, rosemary, thyme, oregano and many other types of herbs that are dancing in my head will make their way into this salt preserve recipe. Herbs and salt all mixed together. Being pinched for time and coarse salt not on the shelf at my local market, I spied a box of rock salt and figured why not. I also like the way the size of it looks in the jar. 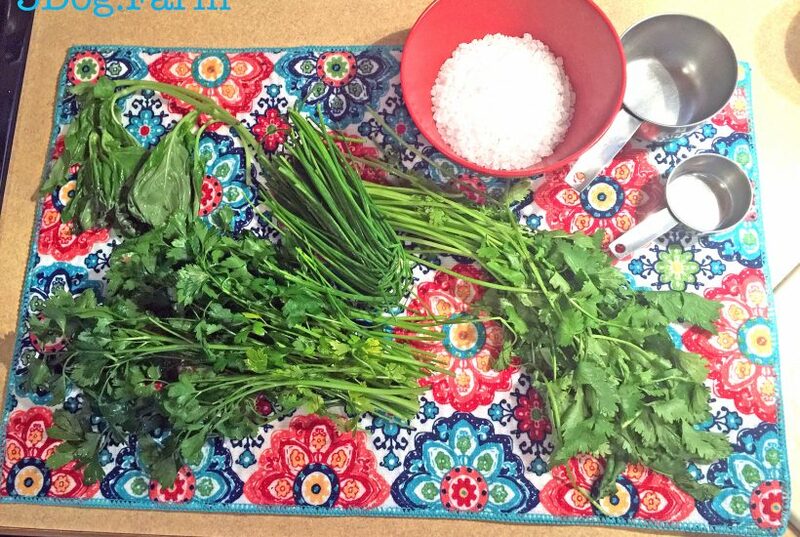 Recipe in a nutshell: chop your choice of herbs, mix with coarse salt and put in mason jars. Easy Peazy! Place the jars in your fridge for one week, giving them a shake daily. The amount of herb preserve will reduce by about half. Transfer to a smaller jar or bottle and store in the fridge indefinitely. Quick and easy but enough creativity for this die hard homemade gift giver to feel crafty satisfaction! Of course, if I had more time I would’ve created labels for the lids but fortunately, I have some paper tags that will work. Previous Post: « Dirty Job? Amend to That! The thing that will get you through these “trying times” (trying to bake in the Easy Bake Barbie Camper oven, trying to cram clothes in a too-small closet, etc. ), and not lose your sanity, is your AWESOME sense of humor. I love that about you! I always say it’s easier to laugh than cry… crying just ruins your make up! Aw thanks Susan! Speaking of such things..Yes… there will be hides in my future! Tanning is on the list. So ears, tails and more… LOL! Love it! I have seen recipes for citrus sugars and salts, and thought they’d make a splendid gift. Adding this to the repertoire. Have to admit I was thinking of you and wishing you were “co-creating” along with me!